Every day of The Edinburgh Fringe Festival, in our 16 year home in The Pleasance Courtyard’s Cabaret Bar! Another year, another bag full of comedy goodies! That’s a wrap from EdCom 2018 and The Showcase Show, here’s a taster of some of the incredible acts we had on this year, and we’ll see you next year! Well that’s a wrap from us here at EdCom, we had another amazing sell out year with the Showcase Show and we will see you all next year! Here’s a few pics from this year, plus our shiny new updated venue, our home of the last 14 years, The Pleasance Courtyard Cabaret Bar. 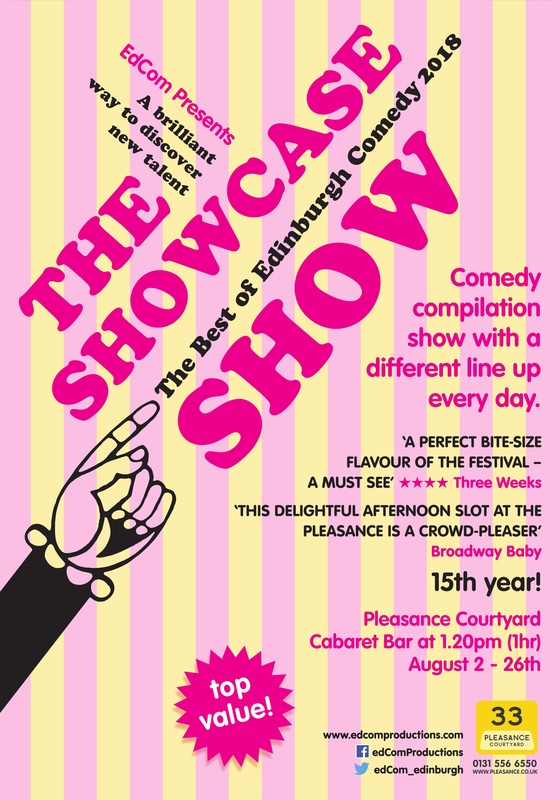 Pleasance Courtyard Cabaret Bar at 1.20pm* (1 hr) August 3 – 27th. Best Of Edinburgh Showcase Show 2016 is over for another year and what a cracker it was! With an amazing array of performers from across the Fringe and brilliant audiences day after day, EdCom says a big thank you to The Pleasance for having us, and to everyone who was involved – we are looking forward to 2017 already! The best and brightest of this year’s Fringe comics in a great value lunchtime compilation showcase. With a new line-up every day including big-name headliners and the hottest newcomers, this is the best way to start the day for comedians and festival comedy fans alike. Now in its 12th successful year. Slick, quick and packed with funny material, Ward presents an hour of high-octane stand-up with sneaky puns and well-hidden one-liners. Invoking the patron saint of comedy, this is a brilliantly delivered high energy show from a slightly manic and always hilarious award winning comic.